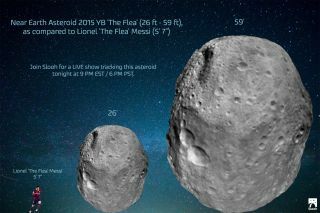 This size comparison shows the size of asteroid 2015 YB as compared to professional soccer player Lionel "The Flea" Messi. The near-Earth asteroid 2015 YB, which is about 34 feet (10 meters) wide, cruised within a mere 36,800 miles (59,220 kilometers) of the planet at around 7 a.m. EST (1200 GMT) today, just two days after the space rock was first spotted. The online Slooh Community Observatory webcast live views of asteroid 2015 YB on Friday night. Slooh nicknamed the small asteroid "The Flea," after Argentinian soccer superstar Lionel Messi, who stands just 5 feet, 7 inches tall. The asteroid was traveling at roughly 32,300 mph (52,000 km/h) relative to Earth at the time of closest approach, according to scientists with NASA's Near-Earth Object Program, which is based at the agency's Jet Propulsion Laboratory in Pasadena, California. 2015 YB is one of millions of asteroids that orbit the sun in Earth's neighborhood. The vast majority of these space rocks remain undetected; researchers have found and catalogued just 13,500 near-Earth asteroids (NEAs) to date. Some of these rocks have Earth in their crosshairs; the planet has been pummeled repeatedly since its birth 4.5 billion years ago, and will continue to take cosmic punishment for eons to come. Most of these collisions involve objects the size of 2015 YB or smaller, which do no appreciable damage. But bigger asteroids do occasionally slam into Earth, and the consequences can be devastating. For example, scientists think that a strike by a 6-mile-wide (10 km) asteroid caused the extinction of the dinosaurs 65 million years ago. But there's good news as well. About 95 percent of the biggest NEAs out there — rocks at least 0.6 miles wide (1 km), which could wreak havoc on a global scale, and potentially even threaten human civilization, if they hit Earth — have already been spotted and tracked. None pose a threat for the foreseeable future.